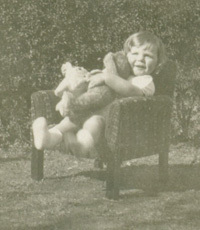 Keith Leslie Condon was born c. 1928, the first child of Hugh Leslie 'Hughie' Condon and Mabel Alice (née Brunskill). Shortly after Keith's birth, Australia was hit by the Great Depression (1929-32). Many children of the Depression Era had few new or store bought toys due to lack of money. Many toys from this time were home-made or make-do. 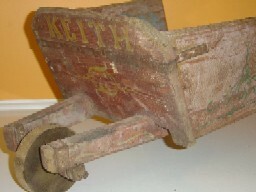 One toy which Keith was given at this time is a small wooden wheelbarrow. The barrow is painted red and blue, is decorated with a green foliage pattern on the sides, and has 'KEITH' in yellow lettering across the front. The barrow was made by a former cooper of the Federal Brewery on The Esplanade, Wagga, who found himself out of work during the Depression. Keith remembers that this man was very skilled in making toys from wood, and his hobby horses in particular were very popular among the local children. 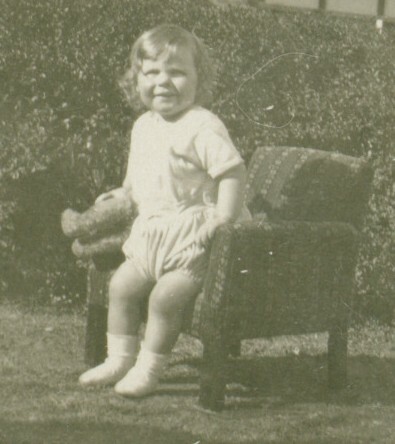 Another item dating to the Depression Era, or shortly after, is a children's armchair. This was hand made especially for Keith, but the manufacturer is unknown.